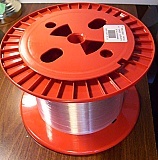 Standard Single-mode bare fiber spool: 250um-coating bare single-mode fiber spool in drum. Standard (conventional) SM fiber. The zero dispersion is near 1.3um. It includes Nondispersion-Shifted Fiber (ITU-T G.652), 1550-nm Loss-Minimized Fiber (ITU-T G.654), and Low Water Peak Nondispersion-Shifted Fiber (ITU-T G.652.C). 3.6km to 26km Lucent/AT&T standard SM bare fiber spool. Low attenuation.